After our train beers, there was just enough time to perk ourselves up with a non-beery coffee before checking into our residence for the next few days, the Future Inn. Lucky for us, we spied an intriguing chalk-board propped up outside our hotel. 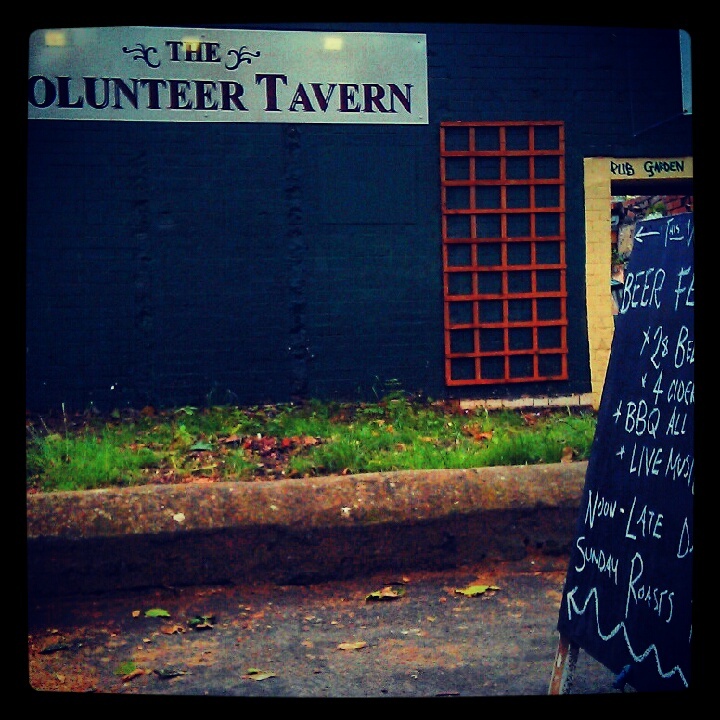 Beer Festival at the Volunteer Tavern you say? 24 beers? But where!? Thirsty from our travels we were puzzled by the lack of directions on the sign but these are the times GPS was invented for. Unfortunately, Google Maps navigation literally took me through the middle of a ghetto in a sweeping circle to get to the Volunteer Arms. It was 2pm and the po-po were already out making rounds of arrests! After my OH nervously told me to get my phone away and hold my handbag close, we finally stumbled upon the lovely little village-pub oasis of beer we had been seeking. We cut through the pub, noting the admirable selection on the handpumps (which includes a dark all-year round!) to the festival in the beer garden. What a lovely beer-garden too, with plenty of mis-matched furniture to go around and high walls.Since it was East Midlands themed, I was delighted to see a selection from breweries not normally seen in our neck of the woods. I was particularly amused at the inclusion of Blue Bee from Sheffield since, being from North Yorkshire, I do regularly mock a Sheffield friend for not being a proper Northerner. Childish, but he is fiercly proud of his Northern roots! I started with a Mr Grundy’s 1914 (5%). Being a nerd I appreciate a brewery with a historical theme and gave myself a pat on the back for immediately picking up the WW1 theme. Other beers include Passchendaele & Lord Kitchener. 1914 was a rather deliciously dark stout with a chocolate and blackcurrant aroma. Drinkable, smooth and unchallenging, the hint of hedgerow blackberries and short bitter finish made it just right to savour in the rare warmth of the day. Entertainment, as is sadly often the case, came from two old-school CAMRA relics. I tried not to choke on my beer with laughter as I heard them tutting and moaning about the imminent arrival of Brewdog‘s new Bristol pub. ‘Well I’ve been to the one in Edinburgh’ one proudly bellowed to the other, ‘and all they sell is keg. I ended up leaving.’ It’s apparently all the fault of this silly American ‘craft beer’ fad. All they want to do is make easy-to-store and easy-to-serve beer with no character. It takes no skill to do this silly ‘craft’ beer. So that’s me told then! Real beer, they went on to decide, is Real Ale from a cask. Apart from the Europeans. They’re allowed to do what they want. Thank goodness for that. So Mikkeller, Evil Twin, you’re cool. Brewdog, Magic Rock, go back to school you talentless upstarts! Taking a break from my lesson in beer, I headed back to the bar to grab me some of that Oyster Stout (4.6%) from local brewer Arbor Ales. I now love Arbor and you will be hearing a lot more about them from me. Wow – if somebody asked me to close my eyes and imagine an Oyster Stout, this would be it. It was the classic little-black-dress of an Oyster Stout – smooth and opaque with a thick, foamy white head and a sweet mocha aroma. A full chocolate malt flavour giving way to silky smooth black coffee and a bitter finish makes this feel so indulgent.Unlike Marston’s, Arbor throw some real Oysters into the boil near the end which I guess almost makes this a meal in a glass? The richness of the Arbor Oyster set my beery expectations high which was unfortunate for the next one. I’d heard a few people talking about Muirhouse Jurgens Jungle Juice (4%) already but in hindsight maybe it”s just because of the fun name because the actual beer was slightly…forgettable? A golden sessiony bitter with a little biscuit and yawn……. In my boredom I was jealously eyeing up the OH’s selection, Tiny Rebel Fubar (4.4%) which has got me rather excited about this new kid on the Newport Brewing scene. They might be tiny (there’s only two bottles in the range at the moment) but I expect massive things from this brewery. At only 4.4%ABV, Fubar packs more of a punch than other stronger beers in its class. It’s a pale ale with buckets of tangy lemon and honey hoppiness and distinctly bitter and just damned gorgeous. The astounding citrus hop aroma was reminiscent of sherbert lemons at the moment you break the hard candy and it starts to fizz on your tongue. 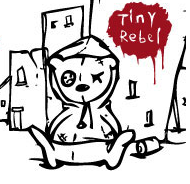 I absolutely cannot wait to see more from the Tiny Rebel. Oh and their marketing’s cute too. After I’d guzzled the last of the poor boy’s tasty Fubar and he finished the dregs of Jungle Juice, we left through the back gate of the beer garden and realised that we were literally two minutes from the door of our hotel and civilisation. Thanks Google Maps.